Last weekend was a nightmare. Something you only hear about, something that only happens to other people. I knew while working at newspapers that one day I would run to cover a spot news event that involved a friend or family member. I just did not expect it to happen this way. On Saturday June 7th, just such an event happened. My best friends Gary and Amy lost their home to a fire. My wife Heidi and I travelled to Healdsburg in Sonoma County, Calif., to visit with Gary and Amy, and to watch their son Benny graduate High School. We arrived on Thursday the 5th of June in the morning, went to a beach as Heidi has never been to a real ocean beach. Then we drove over the Golden Gate Bridge. That was fun. Scratch that off the bucket list I guess. Shortly after that we went to the docks in Sausalito to check out the boats. Gary and Amy love to sail. Especially catamarans. Gary works for Mendocino Brewery in Ukiah, Calif., as the Head Brewmaster. Amy is a CPA in Healdsburg owning her own business. Gary and I have known each other since high school. During the summer of 79, my mother and father split forcing me to take a stand. I did not want to move from Illinois to Arizona with my mom. I did not want to stay with my dad. So, I moved in with Gary and his family for my senior year. And those were good times. Waking at 4 am to sneak out to go fishing before school, parties, good old teenager stuff, but we still maintained good grades. I joined the Navy shortly after graduation in 1980, but we soon lost contact. Thanks to Facebook, we’re back to our old shenanigans. Well, almost. During the evening of Friday the 6th, Benny had his graduation ceremony at Healdsburg High School. It was nice. Beautiful weather and extraordinary light. On Saturday morning, Gary and I went over our photos to make some prints so we could then put them on a poster board for the graduation party at another house. We left the house at 2:30 to stop by CVS Pharmacy for prints. Yeah, not the best place to make prints, but it was the most convenient. I left almost all my gear except my D300s digital body, F5 camera body, 80-200 lens, and 17-35 lens. I also hooked up my Lacie Rugged 1TB portable drive to my laptop and began copying the photos I’ve shot so far incase my hard drive crashed. Amy had already left to help set up the party. Benny left and was hanging with friends. Heidi, Gary, and I stopped by CVS to get the prints and paste them to the poster board. At about 2:50, we arrived at the party. Everything was going well, when at 3:15 Amy came running in yelling that she had to leave because her house was on fire. We all left in separate cars. As we approached the house, you could see a thick column of smoke rising in the distance. When we arrived, the back of the house, including the kitchen, dining room, living room, and master bedroom, was completely engulfed. The only thing any of us could worry about was the three dogs Atticus, Trouble, and Hercules. As the firefighters battled the blaze which was now in the attic, people said they saw a dog that looked like Atticus a few blocks away. Gary, Benny and a few others ran off to find him. They couldn’t. After a few hours, the flames were out but you could see a little smoke coming from here and there. The firefighters mopped those up. The good news is, they saved most of Amy’s business records. And being the smart woman she is, she had backed up all her computers and digital records to the cloud. The bad news is the dogs did not make it. The firefighters found them in one of the back bedrooms. They died from smoke inhalation. The house was a complete loss. Thankfully, insurance will cover the home and replace their household items. Heidi and I lost our luggage, the camera gear, my laptop and portable drive. But everyone was safe. Thankfully I backed up my laptop before leaving our house in Bellingham. The only thing really lost was the photos of Benny’s graduation. I am sad for that. The fire inspector determined a rat chewed through wires under the back deck causing the fire. Thank god it didn’t happen at 3 a.m. But what I fought the entire time was should I shoot photos or not to shoot. The emotions were not only raw and real, but those of close friends. That made them even stronger. I’ve shot breaking news before and have captured this raw emotion. But those are people I’ve never met and most I never would. It was different. Or is it? Watching the fire and my friends filled me with horror, helplessness, sadness, and empathy. Although it’s been a week, the raw emotion I felt is still there. I did shoot some, mainly the house though. Not really much. 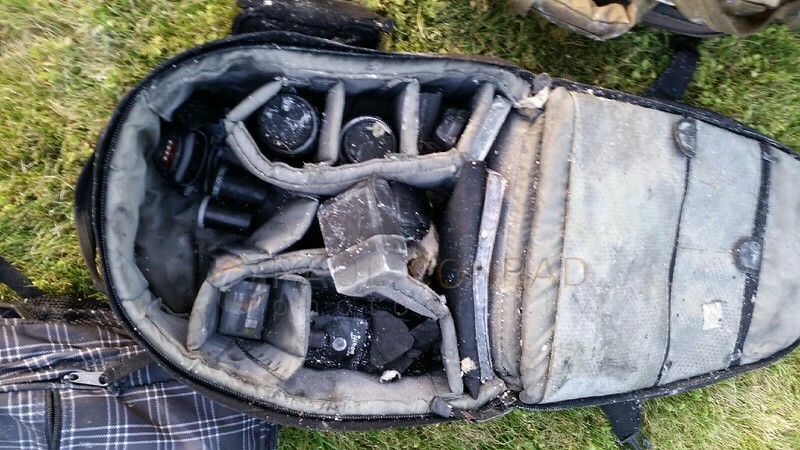 © Paul Conrad/Pablo Conrad Photography – What’s left of my camera gear after a fire destroyed my best friend’s house. My wife and I were visiting to celebrate his stepson’s graduation from high school. What are your thoughts? Should I have shot the action/reaction? Or be what my friend’s needed: a friend. I am so sorry for their horrible loss. Thank you Amy. They’re moving right along getting her CPA business up and running, and the house permits are going through pretty quick. They now have a place to live as the house gets rebuilt. Thanks Amy. I’ll pass that on. I am glad that the people survived, but sad for the dogs though. I think your friends will appreciate your holding back on the photos. This perhaps may not be something they want to relieve again by looking at pictures. Sorry about that Paul… What a horrible thing to happen to them… and you & Heidi. Interesting question. For me (with calm time to think about it) my decision would be (ideally) based on my knowledge of the people… I have some close friends that shooting house and them would work. Other friends… shooting anything would not work. THEY are the important factor and thus my knowledge of their personality would determine what I do. When in doubt, I would back off (first back off from shooting people, which you did, and second, in some cases, back off entirely). But it’s unfortunate that you had to make that choice. Sorry for their loss of the dogs and so much else too. Thank you Mark. It was such a struggle the following week. Being a journalist and seeing the incredible raw emotions my inner demons fought whether or not I should have shot them, to shoot them, or to just be there for my friends. I think I chose correctly. It’s something I knew I’d run into working for small papers. But Heidi and I just didn’t run to a news incident, we were involved. It was so heartbreaking to witness. But the good news is that Gary and Amy are getting things done rather quickly. They now have a house they can live in until their is rebuilt, Amy’s business is up and running, and the permits are approved to tear down the old structure. They’re just sad over the dogs. So are we. What a heartbreaking story! I honestly have no idea what i would have done in that situation. I definitely think you did the right thing by only shooting photographs of the house because you were there for your friends when they really needed you. Paul, you know exactly what to do. You take care of your friends first, always. Thank you so much Jordan. The family is moving right along getting Amy’s CPA business up and running, and the house permits are going through pretty quick. They now have a place to live as the house gets rebuilt.